Jyrgalan. You’ve probably never heard of it, but soon it will become a well-known name among the adventurous. The time to travel to the Village of Jyrgalan is now. 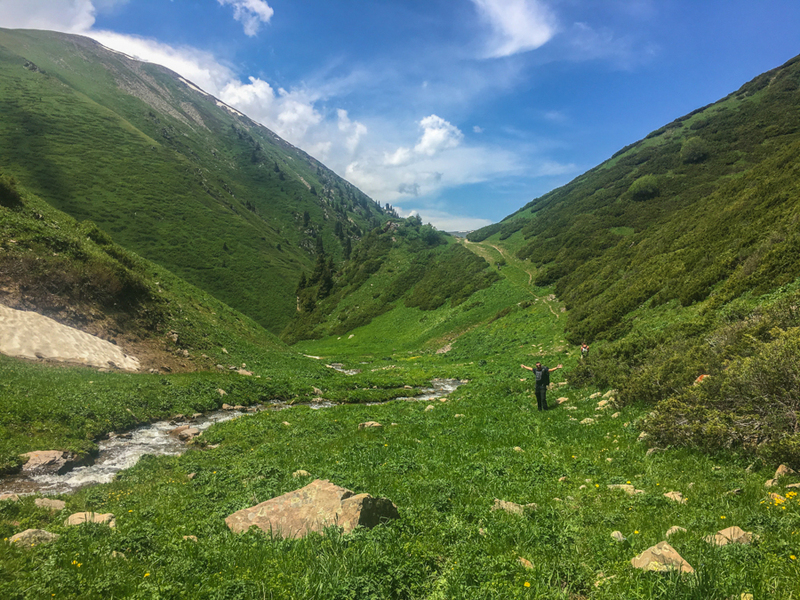 This is the ultimate off-track trekking destination in Kyrgyzstan and with the new Keskenkija Loop Trail recently marked by yours truly, believe me, it’s an epic hike you won’t want to miss! We first came to this rugged and unspoiled country back in 2013 and we had hopes of getting far off track. 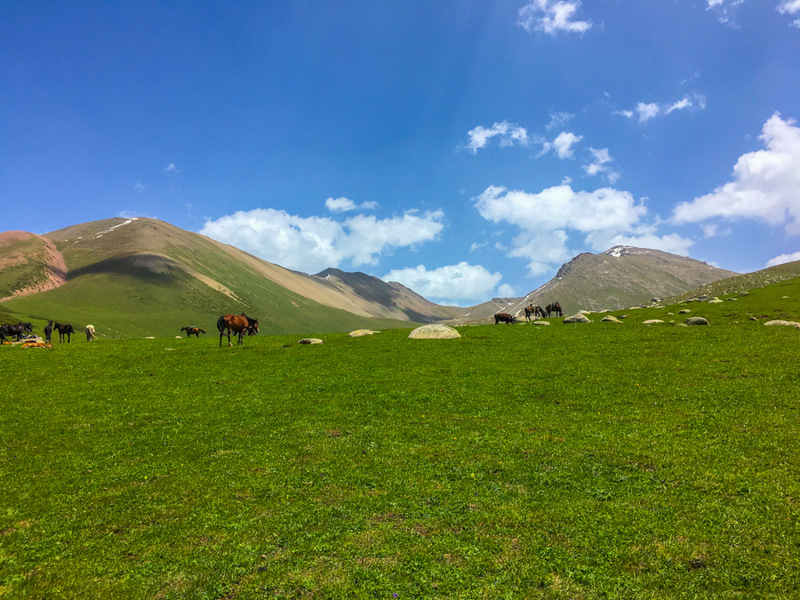 Both to our dismay and our relief, Kyrgyzstan had a well-trodden tourist trail. It was hard to get away from it with so many excellent options within easy reach.  NOTE: For any inquiries about Jyrgalan, the Keskenkija Loop Trail or other experiences and activities in the area, please feel free to Contact Us with any questions. We will answer as soon as possible. 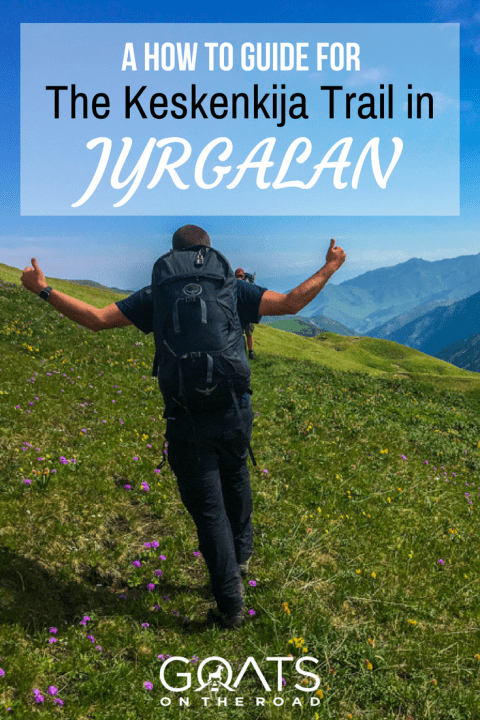 Alternatively, please visit the new Jyrgalan tourism website which lists all available treks and practical information for visiting the area. But for those who crave the unknown, have a thirst for adventure and want to find a slice of mountain paradise all to themselves, we have a secret, but it won’t be a secret for long. 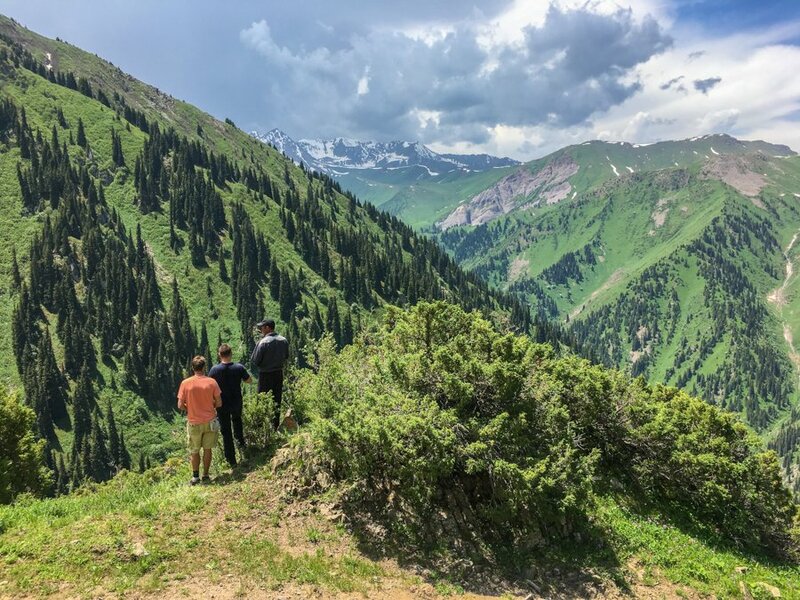 If you want to get off the beaten path in Kyrgyzstan, then Jyrgalan should feature at the center of your itinerary and for the ultra-intrepid, the Keskenkija Loop Trail is waiting for you with stunning views and challenging, high altitude mountain passes. 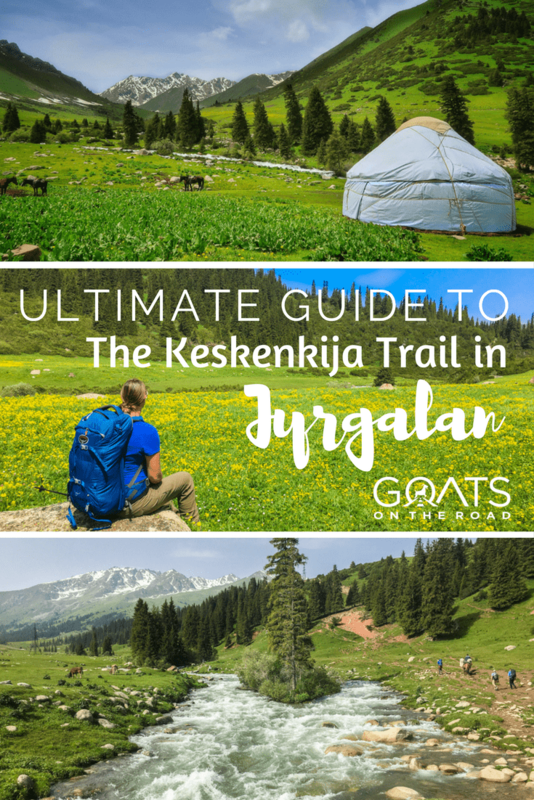 Here’s my how-to guide for trekking the Keskenkija Loop Trail in Jyrgalan, Kyrgyzstan. 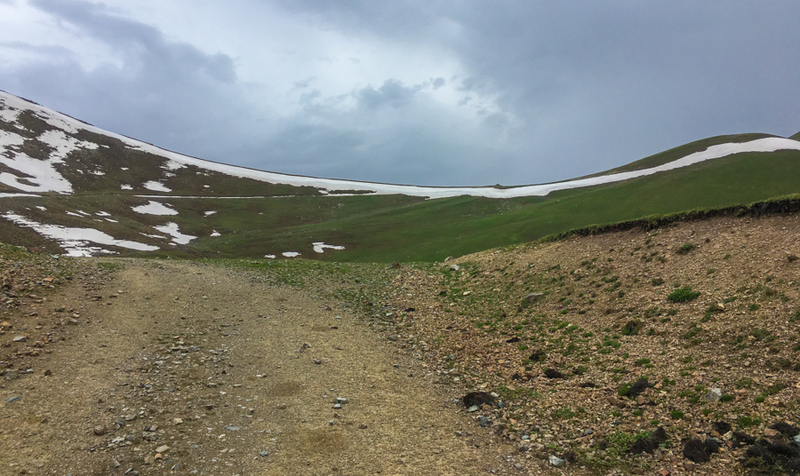 In this section I’ll fill you in on the price, the logistics, what to pack and what to expect on this incredible loop trek. 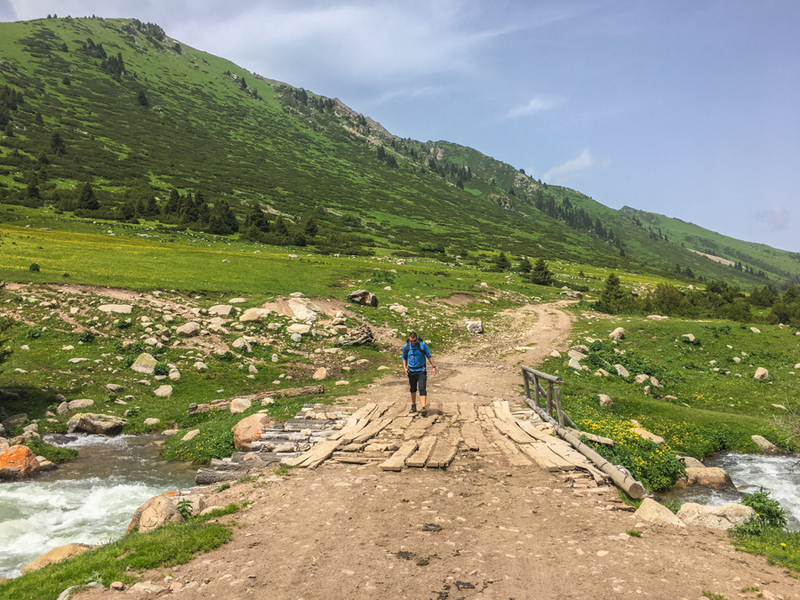 It all seems daunting at first, but once you hit the trail and you breath in that fresh Kyrgyz mountain air, you’ll know it was worth all of the planning, plus the DMO (tourist office) in Jyrgalan, makes planning this trek a breeze. 1. Hiking on foot independently. Cost: Free. 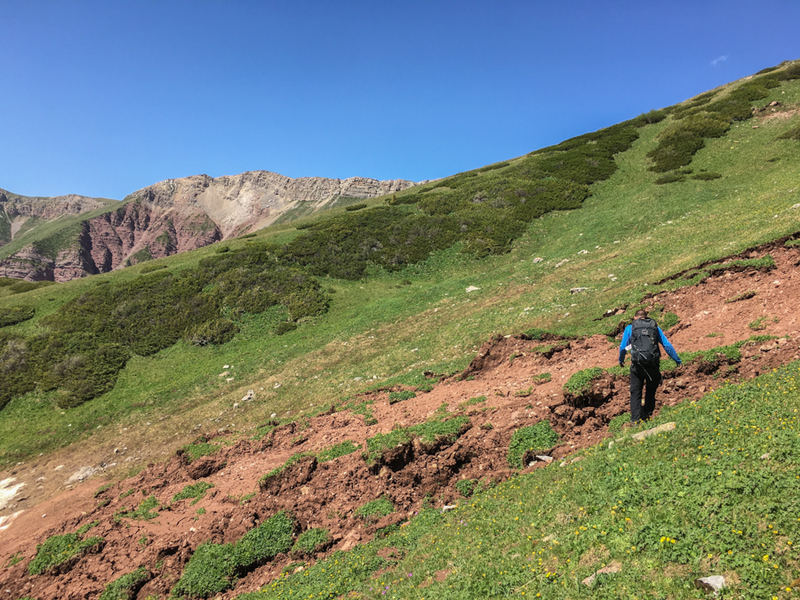 Be aware that there are places where the trail still isn’t marked very well, so always have your eyes open for red arrows and alway try to follow the most obvious path. Plus, make sure to have a map and a compass with you. 2. Hiking on foot with a guide. Cost per day: Trekking guide is 2,000som ($28.75, Kyrgyz speaking), 2,500som ($36, Russian speaking), 3,000som ($43, English speaking). For two or more people, add another 700som ($10) / person / day. 3. Hiking on foot with a guide, pack horse and cook. 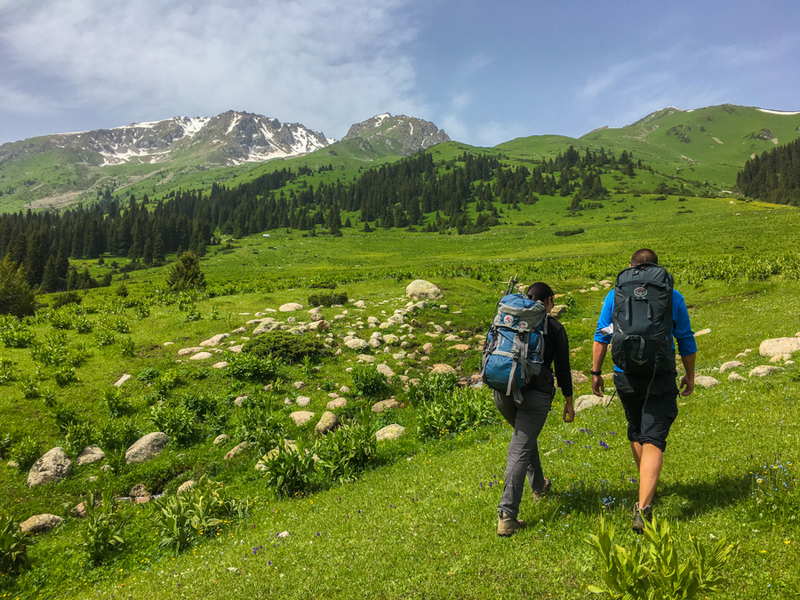 Cost per day: Trekking guide is 2,000som ($28.75, Kyrgyz speaking), 2,500som ($36, Russian speaking), 3,000som ( $43, English speaking). For two or more people, add another 700som ($10) / person / day. Pack horse – 1,300som ($18.50). Meals – 350som ($5) lunch, 350som ($5) dinner, 300som ($4.30) breakfast and snacks. Equipment rental if necessary: 1,000som ($14.40) for backpack, tent, sleeping bag and sleeping mat. Total: 6,800som ($97.70) per day for 1 person, including equipment rental. This trek takes 4 days, for a total of 27,200som ($391), roughly $100 / day. Note: For 2 trekkers, the total cost increases by $150, making the total price $550 for a 4 day trek for 2 people. For 3 people, the cost is reduced even more. 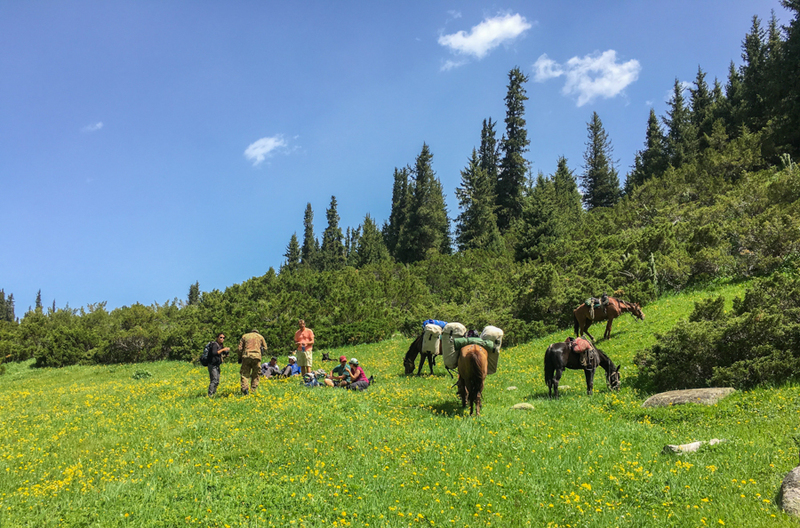 For 4+ trekkers, more pack horses would need to be hired. If you want an English speaking guide, note that you will need to inform the tourism office (DMO) in Jyrgalan ahead of time. *Please note that these prices are all approximate at the moment as the Destination Marketing Office (DMO) are working on finalizing the rates. Once these are finalized, we’ll update this article! I personally think that because this trail is so new (we literally just plotted it out on June 15, 2017), it’s best to have a guide with you. 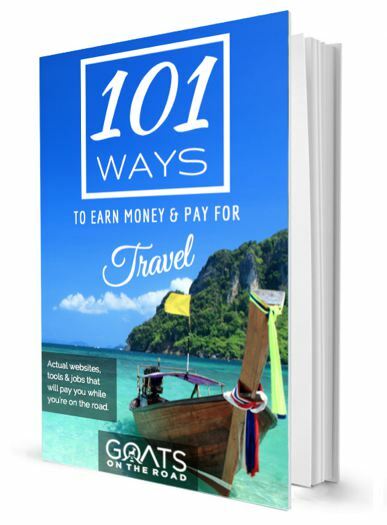 If you choose this option, you then need to decide whether you will pack your own food, cooking and camping gear, or if you will hire equipment and have the guide cook for you. 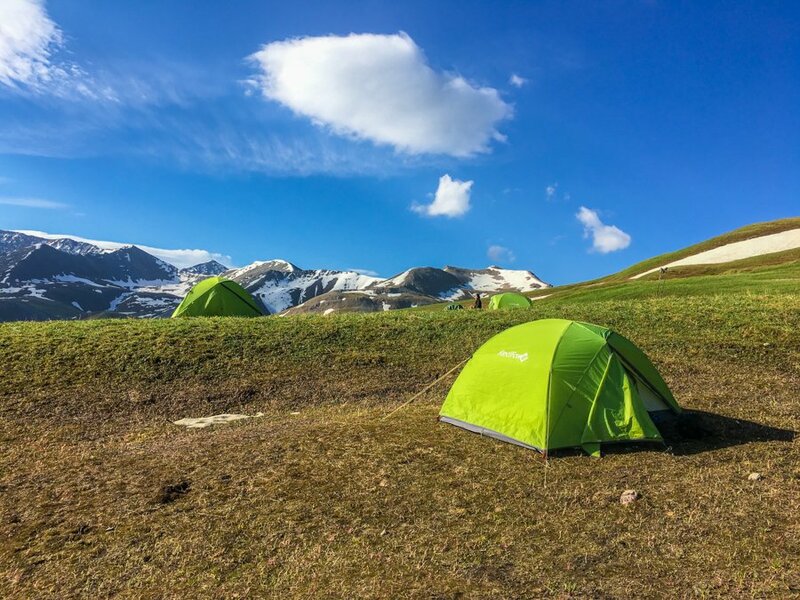 The camping equipment for rent in Jyrgalan is in very good condition. We had a brand new RedFox tent and two sleeping bags that had just come out of the packaging. The sleeping mats were old-ish, but that doesn’t matter. 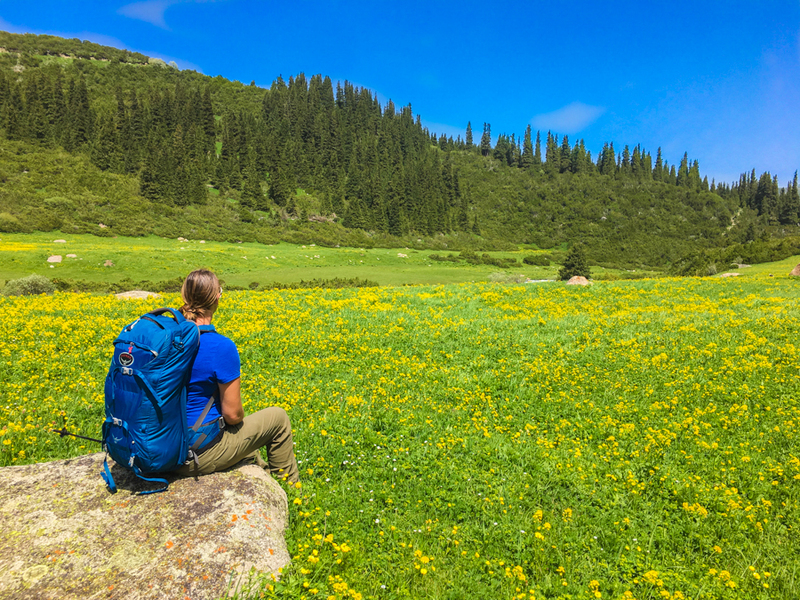 Keep in mind that if you don’t have a pack-horse, you will be carrying all of your gear on your back, so lightweight items are key. When camping in the mountains, the weather can change in an instant. Even during the spring / summer months. It’s important to be prepared for all conditions. When trekking in June, Nick slept in a +4°c comfort level sleeping bag, and I slept in a 0° comfort level bag. Our tent was 4-seasons and we slept with our warm clothing on. Comfortable backpack. You’ll be wearing this each day so make sure you have a pack that distributes the weight properly and fits you comfortably. A proper trekking, top loading pack would be best, but we trekked with our Osprey Farpoints and they were comfortable and got the job done. If you’re packing your own food, the weight will add up quickly and while the Farpoint would still work, it would be wise to choose a bag with better support. Lightweight tent (3 or 4 season). A sturdy tent that can handle the elements is crucial on this trek, and on any trek. You might have rain, hail, snow or if you’re lucky, pure sunshine! A four season tent is best, but a three season will do if you have a warm enough sleeping bag. Lightweight sleeping bag. A sleeping bag is the most important thing you’ll pack. If you’re too cold at night, you’ll be miserable and exhausted from having no sleep. A lightweight sleeping bag is key (unless you have a pack-horse). Nick is a “hot” sleeper and was fine in a +4° bag, while I was comfortable in a 0° bag. Even so, we slept with our warm clothing on at night. I would suggest a 0° comfort level sleeping bag at minimum. Sleeping mat / ground mat. A mat will make your sleep more comfortable, but it will also help to keep you warmer at night as it raises you off of the ground. Trekking poles. These aren’t necessarily a must-have, but to help with river crossings, slippery slopes and uneven terrain, they come in handy for sure. Headlamp. When the sun goes down, there is no light available. You’ll want one for the evening and those late-night bathroom breaks. Water bottles. I say bottles plural because although there are numerous water sources available, they are a bit spread out in some places. It’s a good idea to have two, 2L bottles on you. There is also very limited shade on this 4 day trek, so it’s important that you drink a lot of water to avoid heat stroke and dehydration. Steri-Pen or water purification tablets. The water along the trail is clear and clean, but there is livestock nearby so it’s a wise idea to purify the water. A UV purifier such as a Steri-Pen cleans the water quickly, while purification tablets take 30 minutes to an hour. Sturdy hiking shoes and sandals. During the day you’ll want to wear a comfortable, sturdy hiking boot. If your shoes are new, or don’t fit properly, you’ll end up with blisters which can completely ruin your trek. Ideally your hiking shoes will be waterproof. In the evenings, you’ll want to take your boots off and put on a pair of sandals. I wear Merrells, Nick wears Keens. T-shirt for during the day. Even though it can be cool at night, it’s usually warm and sunny during the day (in the spring / summer). A thin, long sleeve shirt will also keep the glaring sun off your arms. Thermal baselayer top. For those cool evenings, either around camp or for sleeping, you’ll want as many layers as possible. We always have our baselayers with us. Lightweight fleece top. Layers are important when trekking and while you probably won’t need your fleece during the day, you will want to have it for the chilly evenings at altitude. Windproof / waterproof jacket. If it’s raining, you’ll want to toss this on, but otherwise, it can help against the wind and add another layer for evenings. Down jacket. A must when trekking in the mountains. Make sure to keep your down jacket dry and don’t wear it if it’s raining. You’ll want to wear the jacket in the evening around camp to keep you warm. We wear synthetic down jackets and they do the job well (although they don’t pack as small as real down does). Hiking Pants. Some people trek in shorts, we always wear pants (for the sun, prickly bush, etc.). I wear pants by Prana, Nick wears a basic trekking pant by Columbia. Thermal leggings. A fleece-lined pair of leggings (long john’s) will be needed on the trail. You’ll want to wear these at night when you’re sleeping. In fact, this was all we wore on our bottom half during the night and we were warm enough. Rainproof / windproof pants. You can opt to wear these if it’s raining during the day, but we usually keep them dry and put them on in the evenings around camp to keep us warm. Look for a loose pair that you can throw on over another pair of pants. They shouldn’t be “fitted”. Beenie (toque). A must for when it’s cold at night. I slept with mine on! Sunglasses. It’s bright and sunny. Enough said. A hat. The sun at altitude is incredibly intense. We both (stupidly) didn’t have hats for this trek and we both burned our scalps. Sunscreen. Again, at altitude, the sun is at its most intense, make sure you lather up. Bandaids / plasters. Blisters are inevitable. Make sure you have loads of these. Second Skins are a great alternative to Bandaids and work better for blisters. A blister kit like this one will have second skins, bandaids and everything you need to keep your feet from exploding. Antibiotic ointment. To keep any cuts or scrapes from getting infected. Anti-inflamatory / pain killers. For sore muscles, headaches, pain. Booze. For warmth in the evening, killing possible bacteria…and fun. Baby wipes. There are no showers along the trail. Baby wipes are a great way to “shower” off at the end of each day. Toilet paper. Make sure when you do your business that you are well away from rivers and camps. Dig a hole and bury your waste when you are finished. Followed by putting a couple of rocks on top. Toothbrush and toothpaste. No explanation needed. Food (if you are bringing your own). Some suggestions: Instant noodles, instant mashed potatoes, vegetables, cheese, sausage, muesli, dehydrated milk, granola bars, nuts, dried fruit, Snickers bars, tea, etc. Note that there is only one small shop in Jyrgalan and if you plan to cook for yourself, you should purchase your food ahead of time in Bishkek or Karakol. First of all, if you’re searching on GoogleMaps.com, it’s not actually where it says it is! They spelled it Jergalan and placed it in the wrong location. Click the link above or view the map below to see the real location. If you’re searching on Maps.me, it’s spelled Dzhergalan. If you read the topographical maps, it’s spelled Jyrgalan. Confusing, I know. 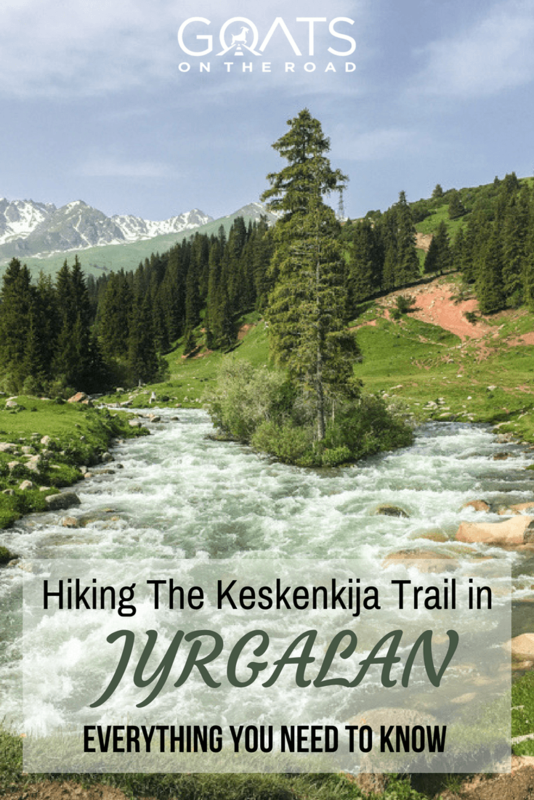 The Village of Jyrgalan is located approximately 47 kilometers northeast of the city of Karakol. 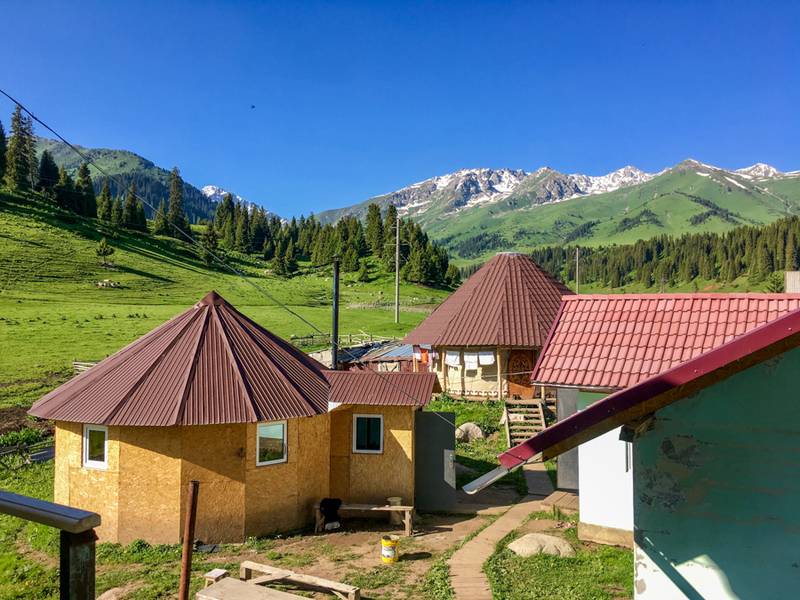 To get to Jyrgalan from Karakol, you simply get on a marshrutka (mini bus) from the main bus station. These run 4 times a day and the cost is around $1 per person. The journey takes roughly 45 minutes. If you’re unsure of how to catch the bus to Jyrgalan, speak to the DMO in Karakol, which is located next to Fat Cat Cafe at 22, Gagarin Street. They can also help you arrange any tours in Jyrgalan from this office. 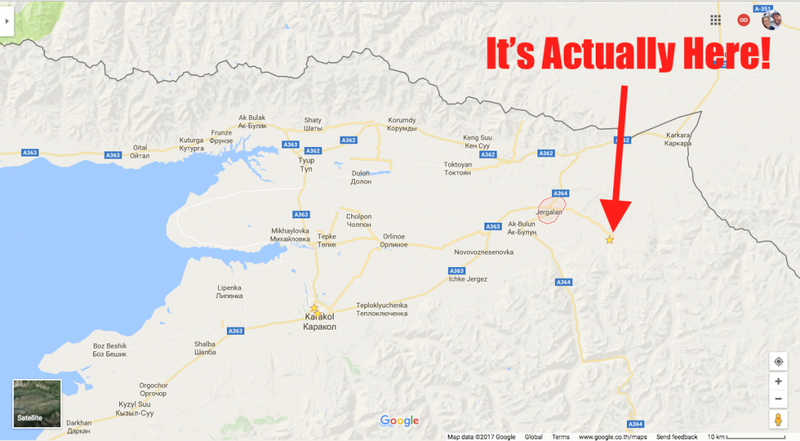 If you’re coming from Bishkek, you’ll need to take the 400 kilometer bus ride to Karakol, which costs around $4.50 and takes roughly 8 hours. From there, you’ll need to switch buses for Jyrgalan. Arriving in the village, you’ll see a “Welcome To Jyrgalan” sign greeting you at the entrance. When you’re dropped off you will easily be able to find your guesthouse. The village is very small, and the guesthouses have plaques on the outside wall that look like the picture below. If in doubt, just ask around. By the time you read this, there should be a map near the welcome sign that points out each guest house and things to see in town. Expert Tip: Having a translation app on your phone that works offline or a Russian phrasebook will definitely come in handy as not many people speak English in the area. As of October, 2016, there are now five guesthouses available for travellers, and 64 beds! Prior to this, there was just one guesthouse. The prices for rooms and meals varies depending on where you stay, which is great as all budget levels are catered to. Alakol Eco-Center, which is run by Emil and Gulmira (and is where we stayed) costs 1,500som ($21) / night including breakfast. Lunch and dinner is an extra 450som ($6.50). Salamat Guesthouse – the cost here is 1,500som ($21), including three meals. Rahat Guesthouse – the cost here is 1,500som ($21) including breakfast. Lunch is 350som ($5) and dinner is 350som ($5). Baibol Guesthouse – the cost here is 800som ($11.50), including breakfast. Lunch is 350som ($5) and dinner is 350 som ($5). Ulan Guesthouse – the cost here is 800som ($11.50), including breakfast. Lunch is 350som ($5) and dinner is 350 som ($5). Rooms at all of these guesthouses are clean and comfortable and staying in a local accommodation is an experience you’ll never forget. The yurt at Alakol Eco-Center is an excellent option as well! Once you’ve found your accommodation and are settled in, head off to the Jyrgalan Destination Marketing Office. 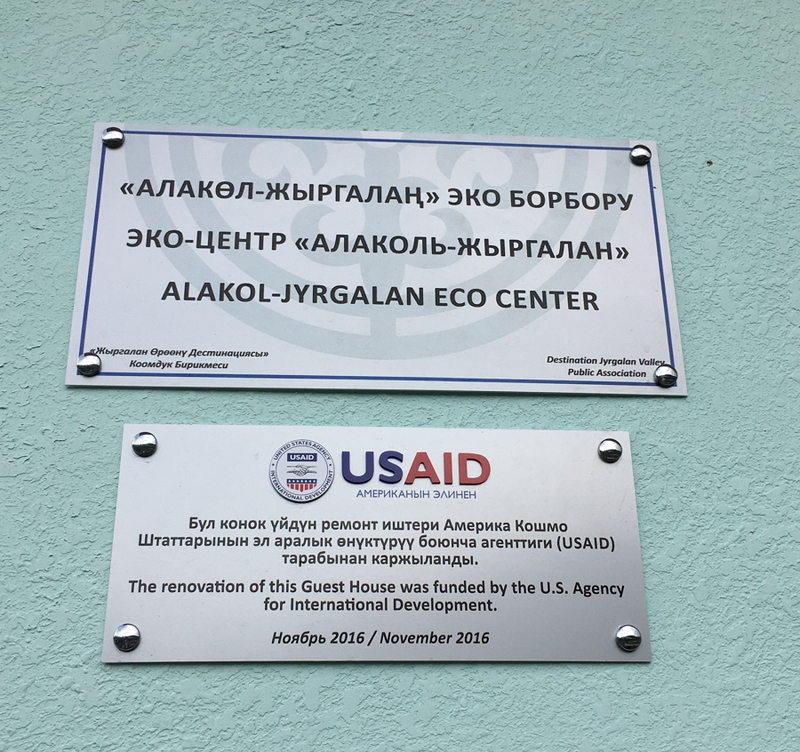 Currently, this is at the Alakol Eco-Center Guesthouse. 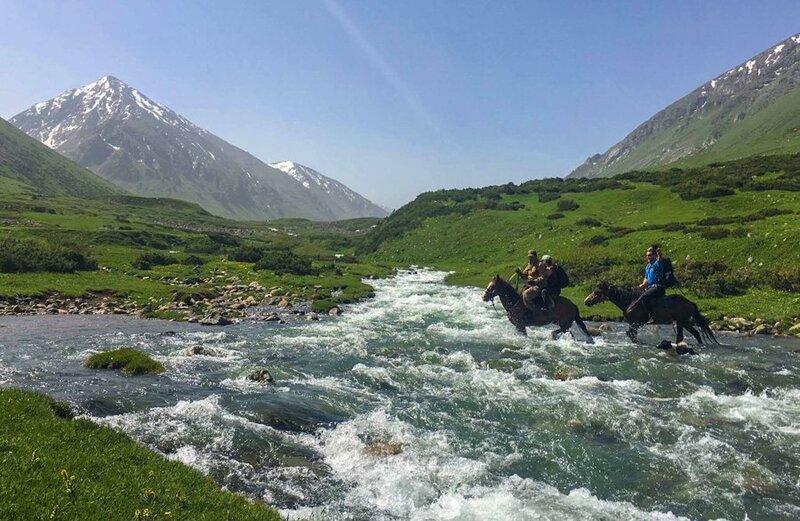 If you’re looking to hire a guide and/or a horse for the trek, you can visit the Alakol Eco Center, contact Tynch at [email protected] or check out the new Destination Jyrgalan website. 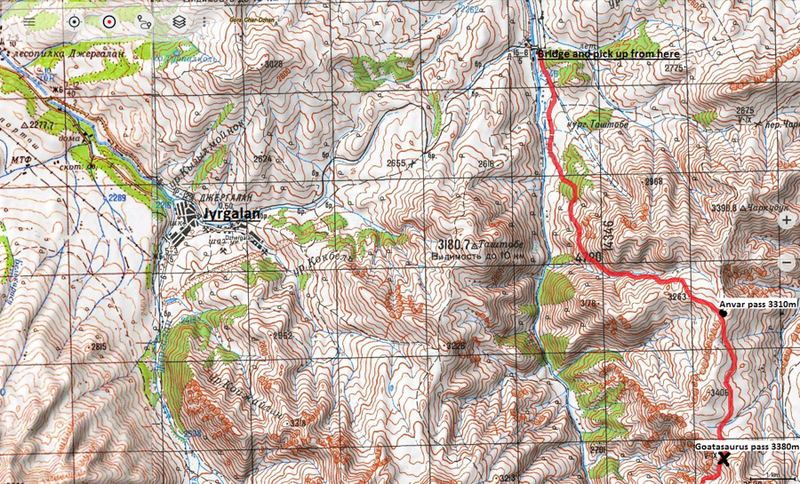 Here are the details of the Keskenkija Loop Trail, which is considered an intermediate trek. 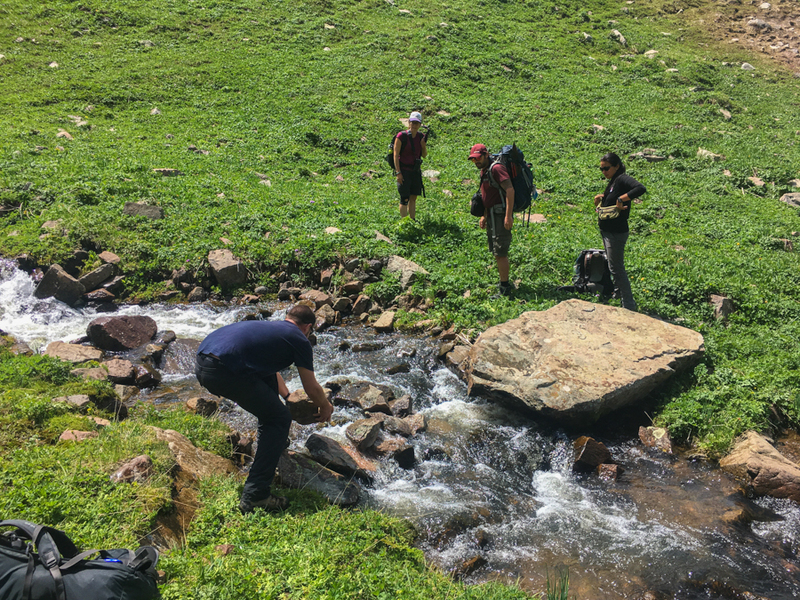 This trek offers breathtaking landscapes, mountain scenery, lovely rivers and some pretty challenging passes. 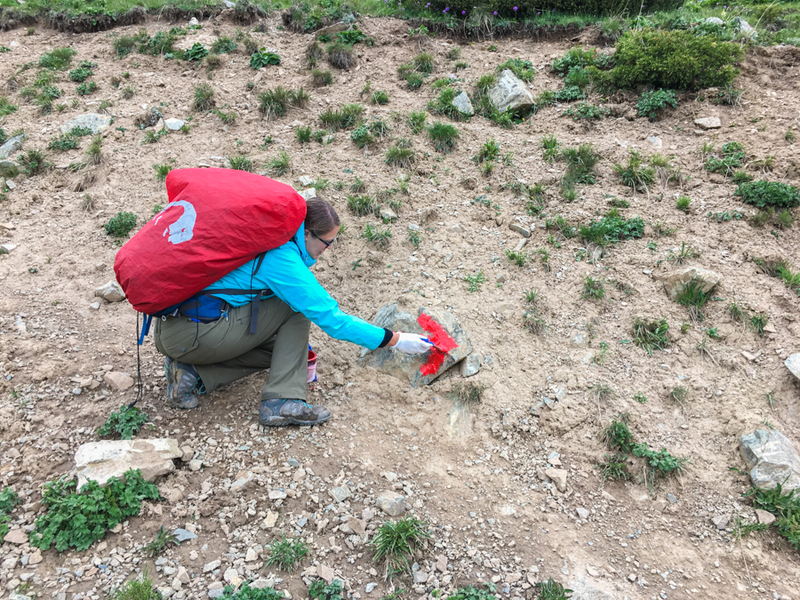 If you’re planning on doing this trek on your own, make sure to be on the lookout for markings (they are still scarce in some places) and read this guide thoroughly. 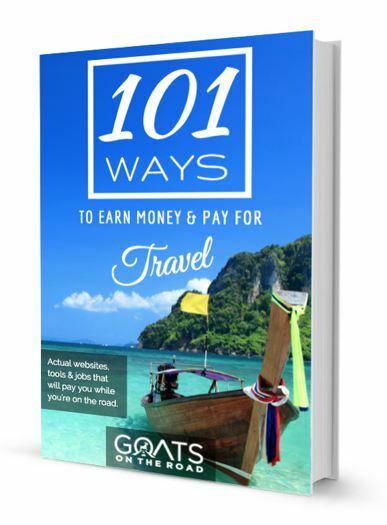 I will break the trek down day-by-day to give you a better understanding of what to expect. Leaving your guesthouses at the far end of the village, you’ll cross a small bridge. Directly across from the bridge there’s a proper dirt road that you can take, or, you can veer south along one of the many goat and horse tracks along the river (which we did). Here you’ll trek over small, rolling green hills with pine trees on your right, snowy mountain peaks looming overhead and the sound of the rushing river to your left. You’ll likely spot some shepherds herding livestock here and a few cows and horses grazing on the vibrant green grass. You’ll follow the right side of the river for a while, before cutting up the hill towards the electrical tower and into the thicker pine forest. Once at the top of the ridge, you will meet up with the road and you’ll be following it for sometime. There are no cars on this road and it’s more a dirt path than anything, but it’s easy to follow. Continuing on along the road, you’ll cross a wooden bridge before climbing a bit of a hill and arriving at the Eki Chat Valley. 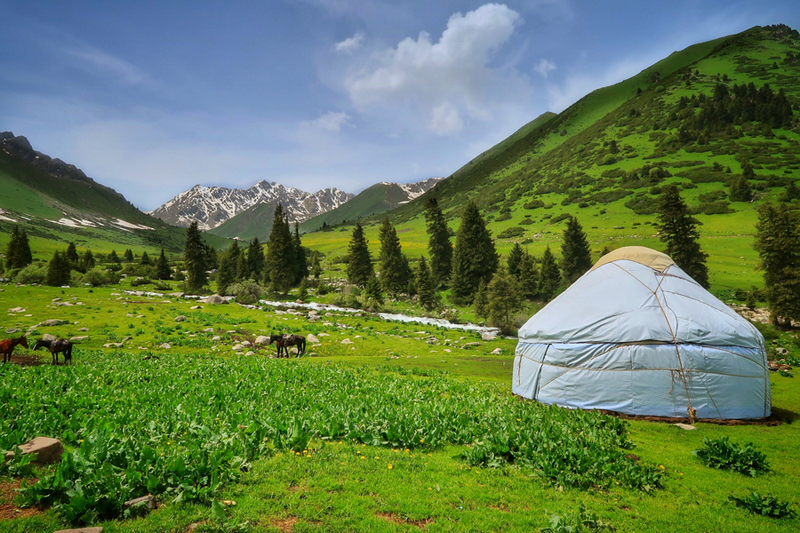 You’ll find some herders here, as well as a rest yurt for tourists. Take a moment to stop and say hi to Danik and his family, who run this tourist stop. You can request a meal if you’d like, or have a quick snack and continue on up the hill. Take a moment here to soak in your surroundings. The Eki Chat Valley cuts between jagged peaks to your right, while the road you’ll be taking continues up into beautiful pine forests. There’s a river cutting along one side of Danik’s camp and his yurts have been erected in a truly picturesque setting. Moving through the Jyrgalan Valley, with the river on your righthand side, you’ll trek for around 9 kilometers from Eki Chat before arriving at a fork in the road. There is a red-painted rock here pointing you to the left. Don’t take this turn just yet. Look around for a place with some flat ground instead. 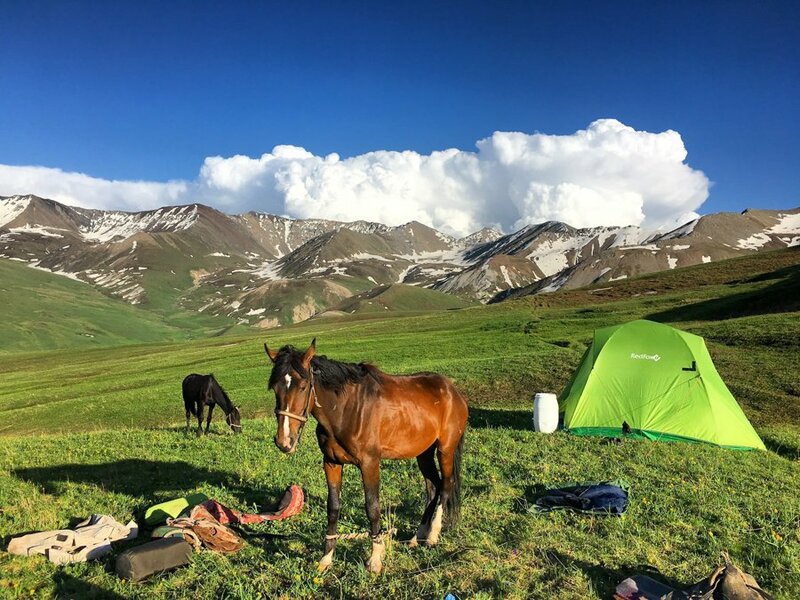 This will be your campsite for the night, with a narrow path winding its way up to the 3,332m Jyrgalan Pass (Ak Kiya) on your left, and the magnificent Tuz Gorge on your right. Today you’ll be crossing the Jyrgalan Pass (Ak Kiya as some locals call it) at 3,332m. The pass is a fairly gradual incline and isn’t all that difficult. It should take you 1.5 – 2 hours to pass. 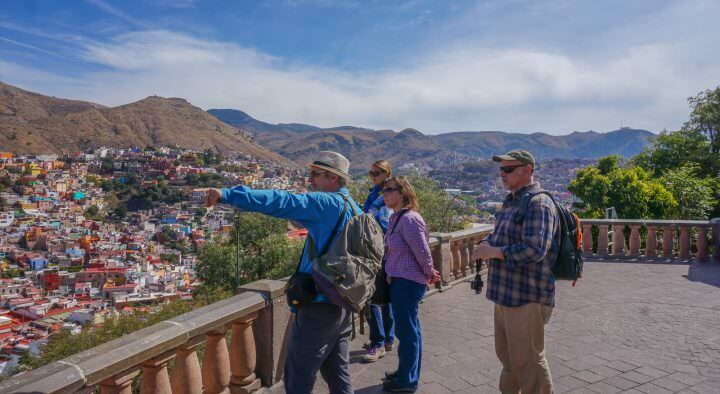 At the top, provided there isn’t any cloud coverage, you’ll be greeted with expansive views all around you. 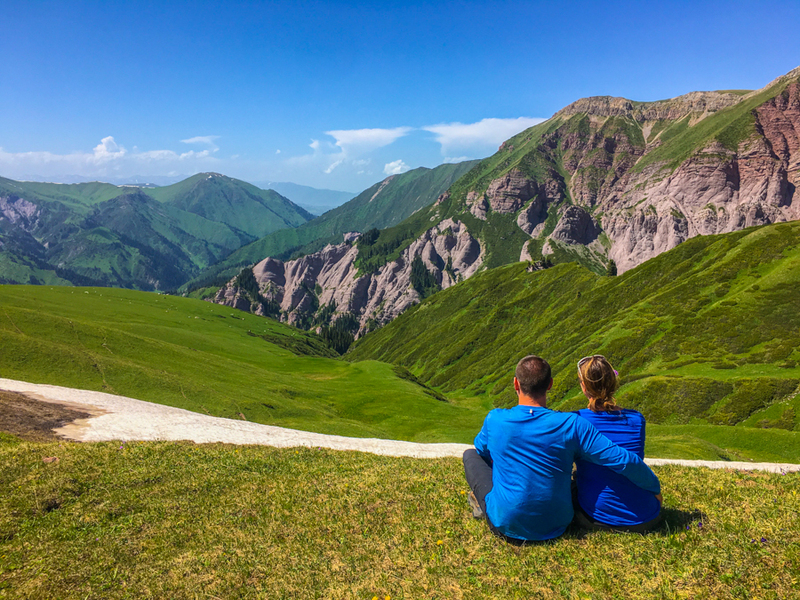 From here you’ll feel like you’re truly in the middle of nowhere, with nothing but icy peaks, small sections of alpine forests and impossibly green, grass-covered hills stretching outward for as far as the eye can see. Head down from the pass on the small path to your right, which follows the ridge. Continue on this road, following the red markers into the valley down below. You’ll need to cross one small river (try to rock-hop), before eventually arriving at the large Tup River on your left-hand side. Depending on the time of year, this river could be an easy crossing, or a difficult one. If you are trekking independently, it’s important to note that you should have an alpine rope with you (40m minimum) and be comfortable (and familiar with) crossing a potentially dangerous river on foot. In June, due to the melting of snow, the river was too fast and too high for us to cross by foot. Luckily, we had horses with us and were able to cross on horseback. Once you’re safely across the Tup River, (depending on the time of year) you’ll see a gorgeous meadow blanketed in millions of tiny dandelions and buttercups, their yellow pedals bringing the valley floor to life. Continue walking until you find a flat spot to pitch your tent. Not only is this an idyllic location, but it’s right near a water source, with the lovely Tup river roaring beside the jailoo. Day 3 starts with you walking through the beautiful valley that you just spent the night in. Butterflies will be dancing between the flowers that blanket the meadow and birds will be chirping in the pine trees to your right. The scenery on this trek is truly some of the best! After packing up your camp, follow the Tup River back the way you came (but now on the opposite side of it), with the river on your left-hand side. You’ll walk through the flower speckled grasslands for about 2 kilometers, before heading up the hill to your right along a horse trail. Keep following the horse trail (and the red markings) through the pine trees before eventually arriving at a plateau / jailoo at around 3,000m. On your way, you’ll pass by a river flowing from high up in the mountains, making it a great place to fill your bottles. If you’re trekking during the summer months, there will be a shepherd here on the plateau with his family and most likely, they will share some food or a drink with you. 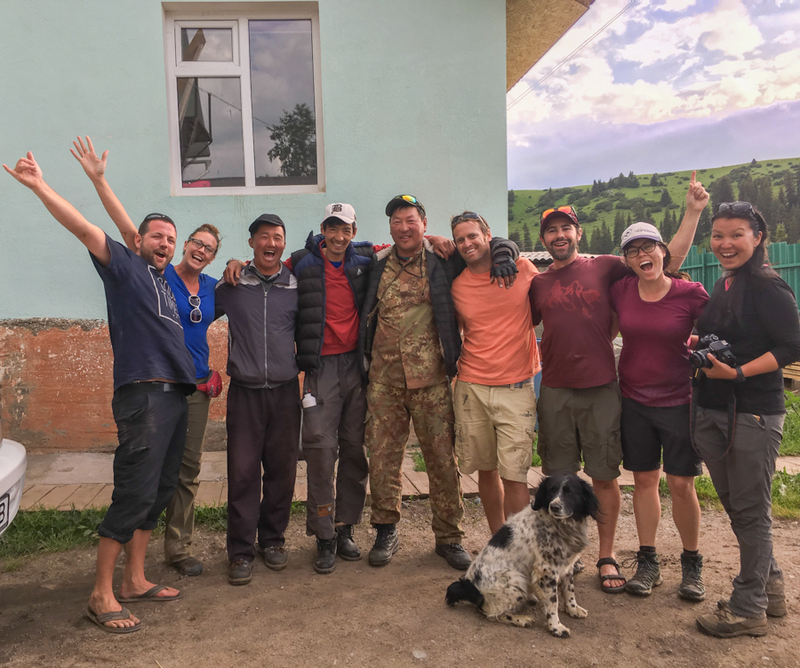 This is a great opportunity to experience true (and authentic) Kyrgyz hospitality. Leaving the family and the jailoo behind, there is a small river crossing. 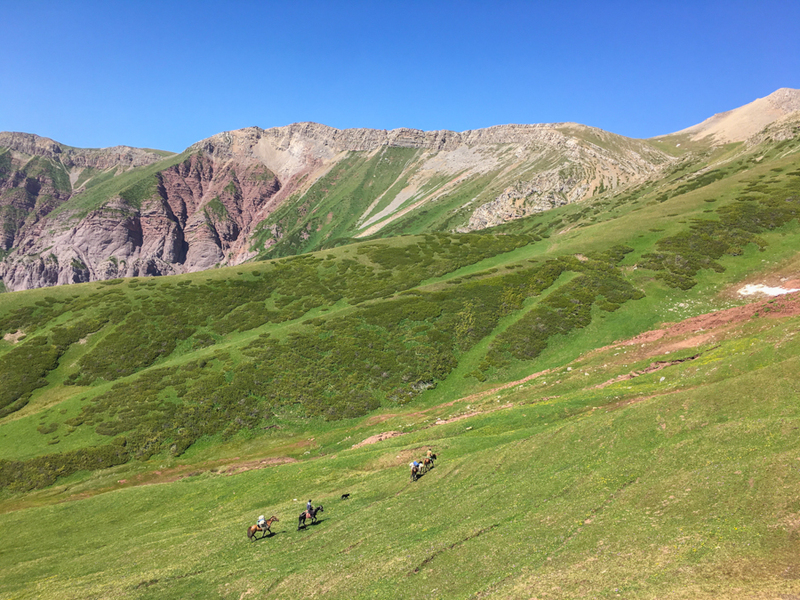 Once across, follow the horse trail along the ridge before reaching another clearing at around 3,100m. Take a moment to bask in the beauty of the red-ish brown coloured canyon before you! There are strangely shaped columns and rounded cones climbing up the side of a multicoloured mountain. This scene is worth a few photos for sure. Next up is a steep climb. Continue along the mountain ridge to your right, and don’t descend. Otherwise, you’ll just have to ascend again. Walking along the ridge means you’ll be walking on a slant, but it’s better than going “up and down, up and down”. From the canyon clearing, the pass will be further up the mountain, to the left, but the path up isn’t visible until you hike part way around the perimeter on the right side of the canyon. The hike up this pass is a bit challenging, but the views are spectacular. Follow the red markings. This pass is at 3,380m and has been dubbed “Goatasaurus Pass” by ourselves and our friends and bloggers, Jarryd and Alesha from NOMADasaurus. Our guides said this pass isn’t officially named, so naturally, we claimed it! Enjoy the moment and the wonderful view before continuing over the saddle and down into the Keskenkija Valley below. During the spring, there will be small ponds dotting the ground, created from the melting pockets of snow. 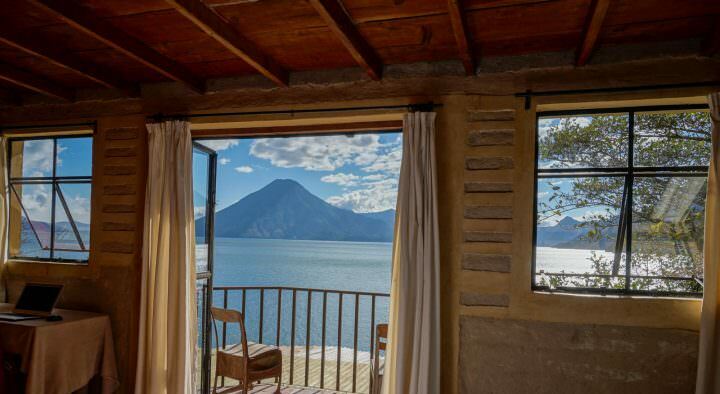 They are so glass calm that at certain angles you can see them reflect the clouds in the sky and the spectacular mountain scenery around you, as if they were enormous mirrors placed in the emerald green landscape. Sticking to the left-hand side of the mountain, you’ll descend down and across a very small stream, before hugging the left side of the mountain and ascending gently along a horse trail to the right. Keep your eye out for red markers. As you start to descend, you’ll see a flat-ish area directly before a very small river. 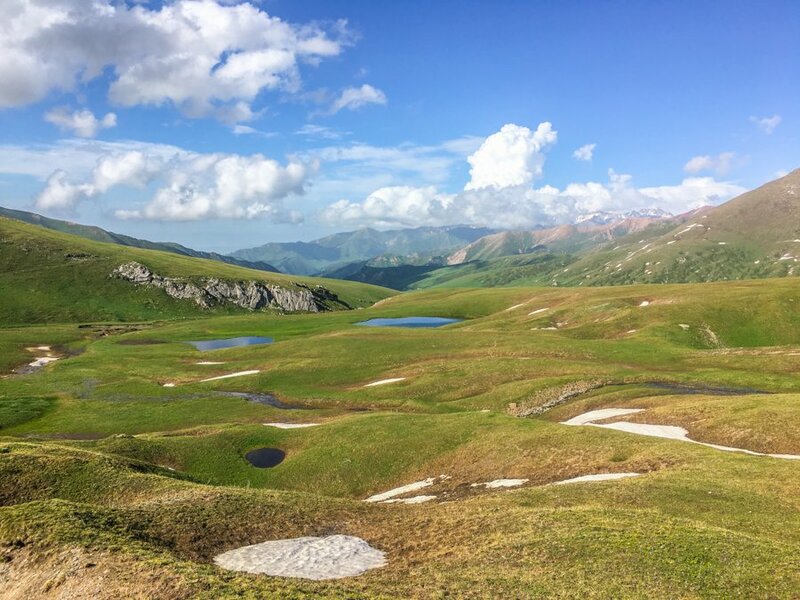 This spot is incredibly scenic and it has a water source, making it a great campsite (3,240m) – regardless of the lumpy ground and slight slope downwards towards the valley below. As the sun sets behind the mountains, look out across the valley at the jagged peaks. That’s Kazakhstan! 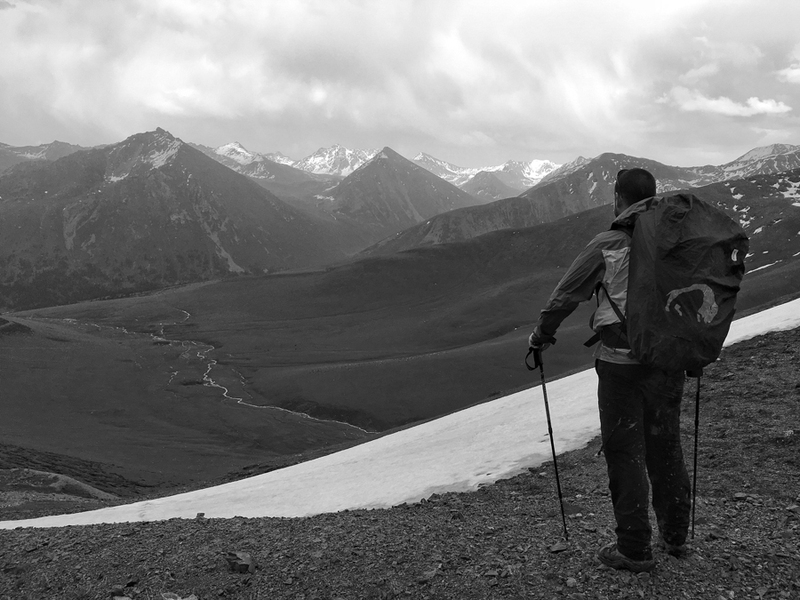 At this point you’ve hiked for over 45 kilometers and you’re right along the Kazakh border. This spot is truly breathtaking, so much so that it may be hard to leave the next morning. The second campsite during the trek, a beauty! Breaking camp, make sure you don’t descend. You have another small pass to hike up first thing, at 3,310m. 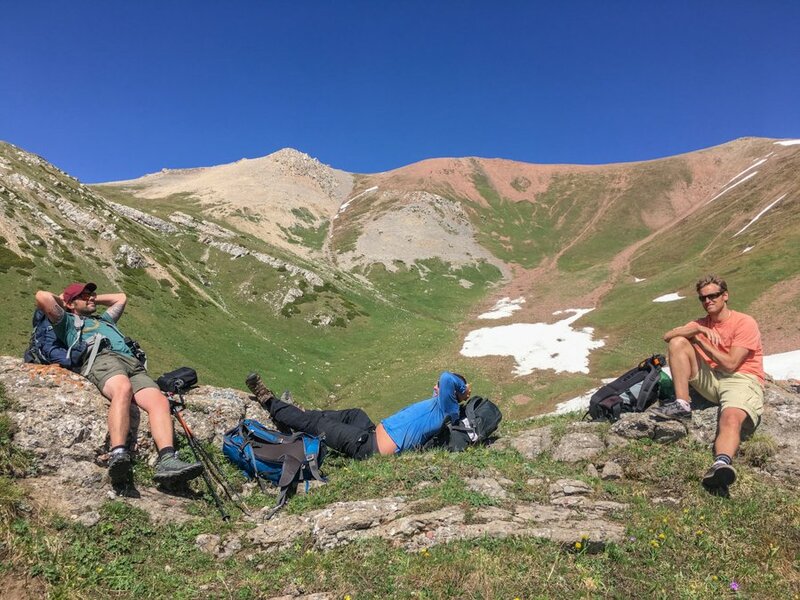 This is called Anvar Pass, and although small, it offers exquisite views over the paths that you traversed after conquering the Goatasaurus Pass the day before, and incredible vistas of the rolling ridges that you’re about to hike over on this, your last final of the trek. 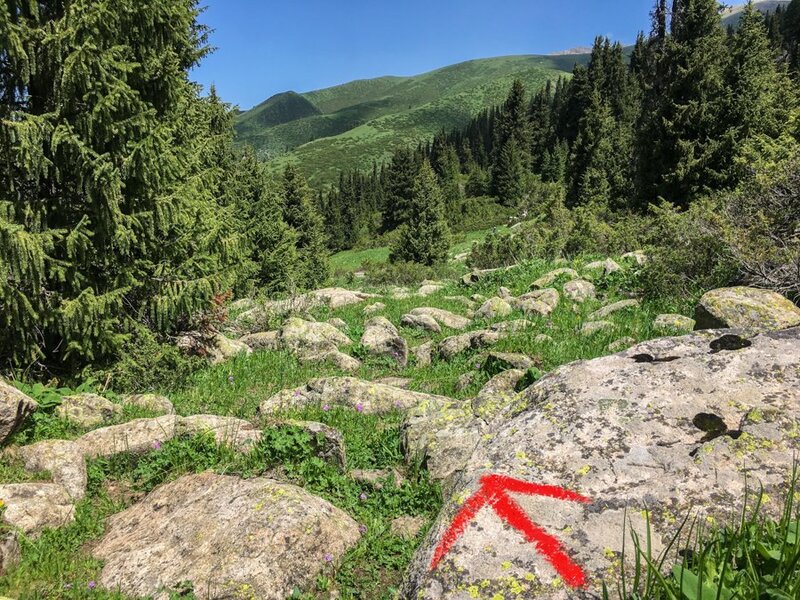 Arriving at the top of the pass, look for the red arrow pointing you down and left towards the valley floor. You’ll be following narrow horse trails now. Your goal is the bottom of the gorge, with a rushing river. You’ll need to cross this river so look for a good spot! We built a rock bridge for you, so if you can find it, enjoy! Otherwise, you may have to create your own. Once across, continue along with the river on your lefthand side. You’ll be hiking over uneven terrain, which can be marshy if it’s been raining. Also, be aware of holes in the ground! Eventually, after hiking alongside the beautiful river, you’ll arrive at a horse trail heading up the hillside and into the pine forest on your right. You can’t miss it. This portion of the trek is absolutely stunning and the incline is easy. 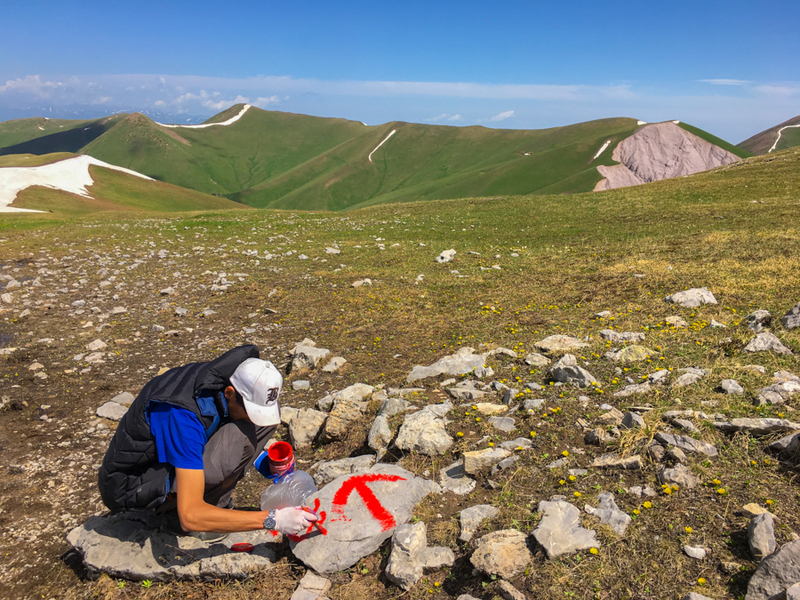 After around 45 minutes or so, you’ll arrive at a beautiful lookout point with Peak Koitor (or Tashtobe) in front of you. You’ll be hiking through the forest here, so you’ll have the fresh smell of pine and the breathtaking views of the valleys in front of you. Once at the lookout, you’ll start an increasingly steep descent. Eventually, you’ll arrive at the valley floor with the rushing Tup River on your left and herders with their livestock. Continue along the Chymynsai valley, keeping the Tup River on your left, passing by numerous families, before meeting up with a wide dirt road. Follow this for a while before you see a bridge crossing the Tup River. If you’ve opted to be picked up from here, this will be where the vehicle will arrive to take you back to Jyrgalan. Note: If you plan to finish the loop, you have another 15 kilometers before arriving back in the village. You can either push on today, or maybe consider spending the night in the valley. We completed the loop back to Jyrgalan and recommend that you do as well. That portion of the trek was beautiful and was filled with herdsmen, livestock and lovely meadows. Plus, coming full circle felt like an accomplishment. However, this portion isn’t properly marked out yet and won’t be until the end of the summer season, 2017. We were following our horse guide who had done this route before and that’s the only reason why we knew which way to go – there aren’t even any trails in some parts. If you are interested in completing the route, you will definitely need a guide to show you the way, or a very good map. Ready to Hit The Trail?! Jyrgalan is the next hot-spot for those with an adventurous spirit. This village is authentic, the people are wonderful and the surroundings are spectacular. 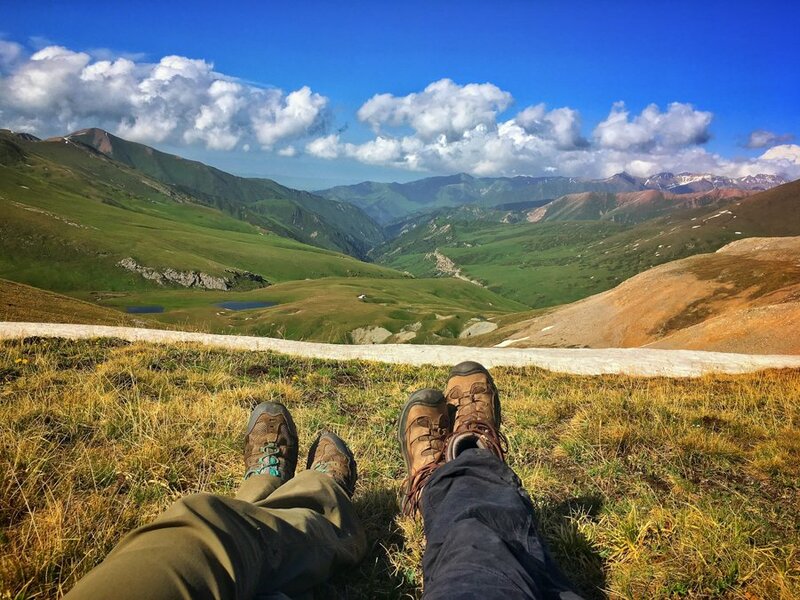 If you’re looking for a unique trekking destination in Kyrgyzstan, the Keskenkija trail offers just that. It’s one of many hikes you can do around the village, but I can’t imagine a more scenic and intrepid trek to do in the region. 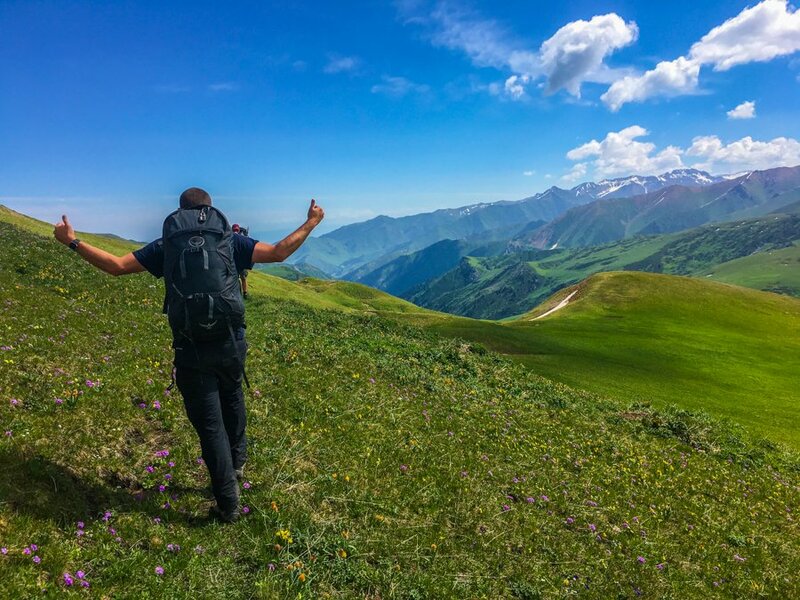 For more information on trekking around the Jyrgalan Valley, please send us an email with any questions, contact Tynch at the Destination Marketing Office in Jyrgalan, or check out the Destination Jyrgalan Facebook Page. 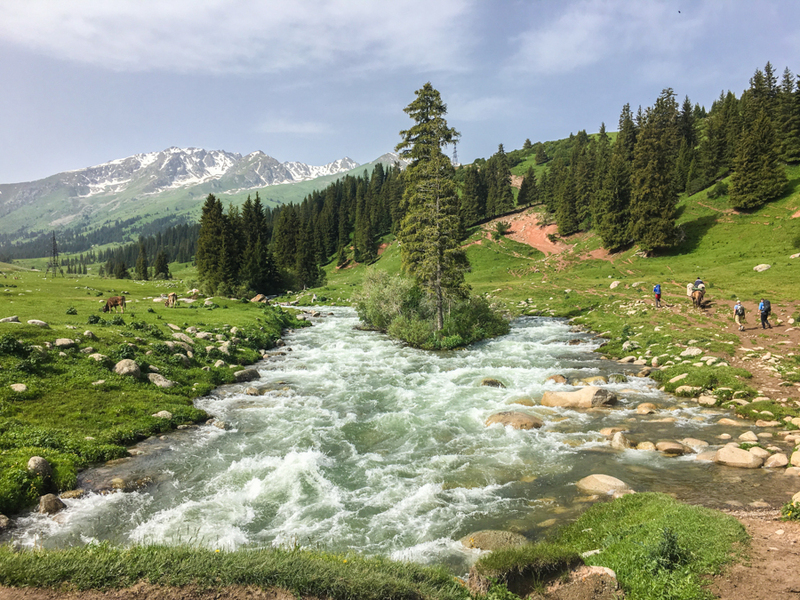 Disclaimer: We feel so honoured to have been invited by Discover Kyrgyzstan and USAID-BGI to explore Jyrgalan and share our experience with you. 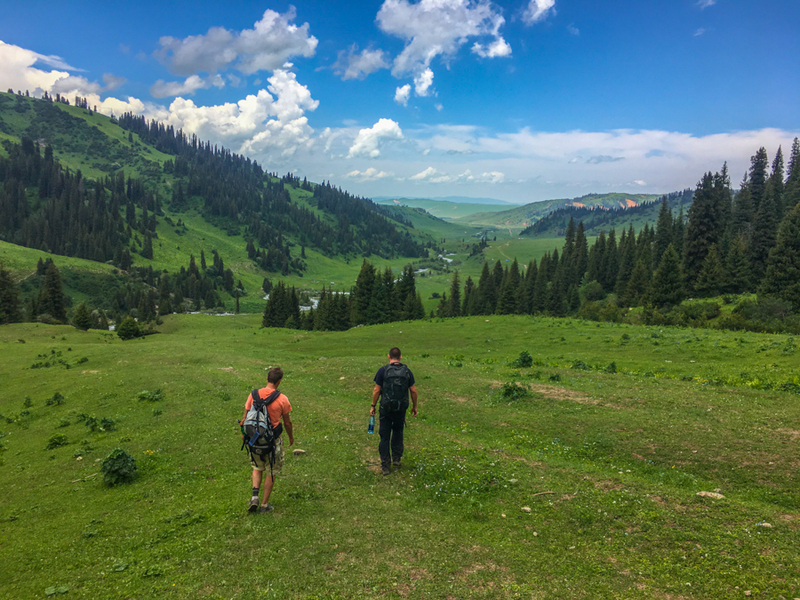 Although this was a press trip, if you’ve been following our blog, you’ll know that we’ve loved Kyrgyzstan ever since we visited back in 2013, and that all opinions in this article are entirely our own. Your photos makes my feet itchy. It looks sooo amazing and exciting. I’m guessing next year is going to be a boom in the area. What time of the year would you recommend to do the trek? Would spring be still too cold? And have you seen any animals on your trek? Hi Dariece, I just got back from doing this trek and first things first – it is just as stunning as you describe. Second thing is that it was a brilliant idea getting you and the the Nomadasurus guys to do this and blog about it. I read your posts and completely changed my itinerary to include it and I’m very glad I did so thank you! Gulmira at Alakol told me they are now getting loads of enquiries. As you mentioned it isn’t only the beautiful vistas that make this trek. I met so many lovely, friendly and most of all hospitable people en route and in Jyrgalan (one of many examples – the family who sheltered us from the freezing driving rain storm on day 4 and fed us as we dried out round their stove). Just a great experience. Indeed inspiring, can’t wait to do it ourselves! If you want to enable others to do this and your other treks independently, may I suggest that you upload your GPS traces to Openstreetmap, and use them to put the paths on the map. 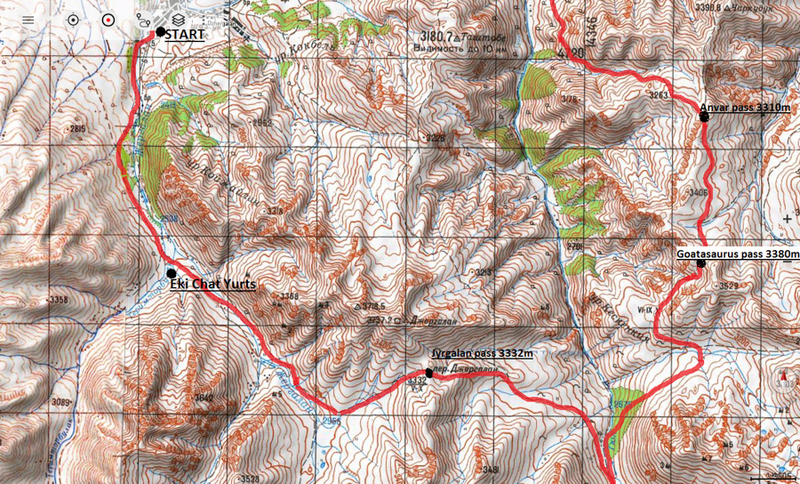 With an off-line mapping app such as maps.me or Backcountry Navigator, others can then trace your steps! Hi, really nice and helpful blog! We are planning on doing the loop, but we are going there at the beginning of june and we would like to know if you think the weather will be good enough for that? I have been trying to communicate with the jyrgalan association but they didn’t reply to my email. Thanks for your message. That’s exciting that you’re planning to do “our” loop We actually were there in June and the weather we had was great. You’ll need to consider the river crossing – if there is lots of snow that has been melting, it will be high, or if it’s been raining a lot.